Engine is available in red or blue. 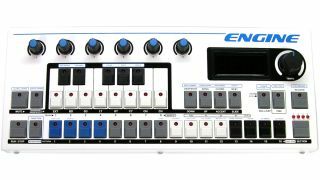 Social Entropy is giving you another hardware step sequencing option to consider in the form of Engine. This gives you eight polyphonic tracks to work with, and is suitable for programming both melodic and rhythmic parts. Each track offers four banks of 16 patterns (that's 512 in total), while patterns can be up to 64 steps in length and chained together to create up to 1024 steps. Other highlights include 64 snapshots and the option to store up to 32 songs. Six knobs, meanwhile, can be used to tweak the built-in performance effects system or send MIDI control messages or control voltages (if you have the optional CV expansion). Standard I/O includes MIDI In and two MIDI Outs, USB MIDI and Din Sync. Find out more on the Social Entropy website. Engine is available now in red or blue colour schemes priced at $665.